The virtual Hop Fastpass™ card is now available to all Google Pay users, making it the first account-based regional virtual transit card on Google Pay in the world. Google Pay users can now add value to their virtual card and tap with their phone to ride on TriMet, C-TRAN and Portland Streetcar. TriMet worked with Google to launch the virtual card in Google Pay starting with a beta last December. The virtual card provides all the benefits of a plastic Hop card, with Adult, Honored Citizen and Youth fares available. Users only pay for the rides they take, earn day and month passes without an upfront cost, enjoy easy loading and auto-loading options and get lost-card protection. The first 1,000 people to buy a virtual Hop card will get it for free courtesy of Google, with a $3 credit applied within 24 hours of purchase. Download the latest version of the free Hop Fastpass mobile app from the Google Play store. Purchase a virtual Hop card for a one-time $3 fee. Load value on your virtual Hop card. Save your virtual Hop card to Google Pay. Hold your smartphone against the Hop reader, validate your payment and go! Hop is a regional, state-of-the art electronic fare system. It works like a reloadable gift card, with the added benefits of a loyalty card, and much more. Hop makes it easier to use the region’s three largest transit providers. Riders use the same card — plastic or virtual in Google Pay — to board or transfer between TriMet, C-TRAN and Portland Streetcar. Go from MAX to a C-TRAN bus – tap the Hop reader to validate the transfer and pay nothing more. Transfer from Portland Streetcar to a TriMet bus – tap to validate – and Hop deducts only the difference of the fare. Hop earns you passes without the upfront cost and without paying for rides you don’t take. Instead of buying a month pass, which can cost up to $100, the pass is earned with each tap to ride. It works the same way for day passes. Take two trips more than 2 ½ hours apart – earn a day pass. Once the value of a month pass is reached (within a calendar month) – riders continue to tap but will ride free for the rest of the month. There is no personal or financial information stored on a Hop card – whether a plastic or a virtual card. Credit and debit card information is assigned secure tokens, which are stored securely with the bank processor, not within Hop systems. Hop account registration brings additional benefits, including lost-card protection. If your Hop card or smartphone containing your virtual card is lost or stolen, the registered account can be frozen and the value transferred to a new card. However, plastic Hop cards cannot be converted to virtual cards. To keep the Hop system equitable for all users, virtual Hop cards will cost the same as physical Hop cards – $3. To date, TriMet has distributed more than 90,000 Hop cards free of charge at community events and to community-based organizations and employers. TriMet thanks our technology partners – Google, INIT and moovel – for their ongoing development and innovation of the Hop Fastpass electronic fare system. moovel N.A. 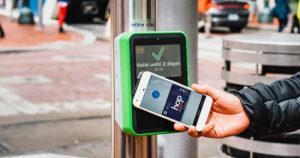 LLC, a part of moovel Group GmbH, enables seamless multimodal experiences and connected transit commerce through mobile applications, including the Hop FastpassTM app and the TriMet Tickets app. The mobile ticketing applications built by moovel N.A. are used by 16 transit authorities in the U.S. and allow customers to book and pay for public transit tickets via their smartphone. This makes moovel N.A. the leading provider of mobile ticketing technology for U.S. based transit apps. Led by CEO Nat Parker, moovel is headquartered in Portland, OR.